We had to dump the Project truck's original half-ton 10-bolt rear axle. The 8-½" diameter ring gear and 1330 U-joint pinion yoke were deemed not up to the task when twisted by a Duramax 6600 producing more than 600-horsepower and 900 lb-ft of torque. Without going the custom (expensive) route for a stronger replacement, we chose the GM 9-½ 14-bolt semi-floater for this six-lug application. Once acquiring the axle, we visited the experts at Randy's Ring & Pinion for a professional rebuild. 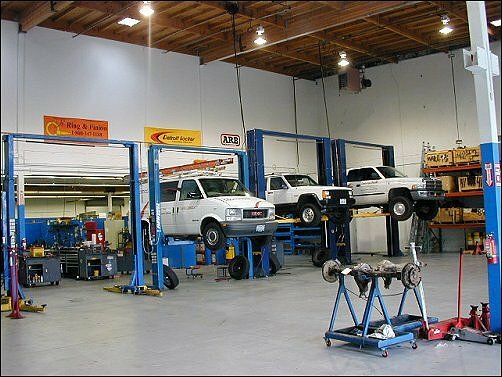 Randy's has been offering 4x4 and pickup enthusiasts with differential parts and service for more than 22 years - operating from two facilities, in both Washington state and in Tennessee. The breakdown of the 75 employees includes 20 retail/wholesale sales staff, while warehouse and service staff total 55. Their parts and service operation covers all popular domestic (and many import) differential parts, including axles, ring & pinions, related installation kits, 3rd members, race parts, tools, lockers and positractions. 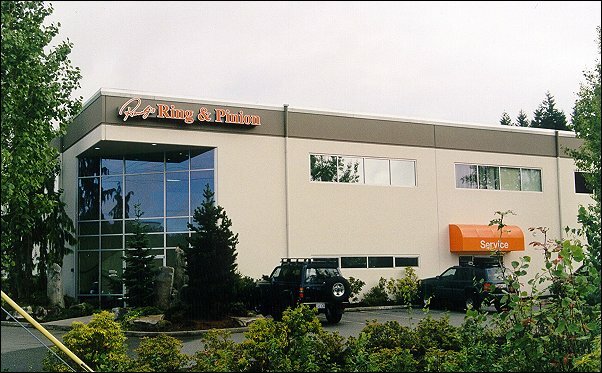 The above photo shows the front of their modern 55,000 square foot facility located in Everett, Washington. According to automotive writer and 4x4 guru Jim Allen, the GM 9-½ has a short-term output torque rating of just under 5,000 lbs-ft (vs 3,800 for the 10-bolt it replaced) and a max continuous torque rating somewhere around 1500 lbs-ft. Jim went on to say that, "In theory, a built Duramax with its massive torque multiplied by the gears will generate way more torque than that, but thank God for imperfect traction. Tire grip can be calculated, but you'd need the exact weight on the rear tires (including some extra for weight transfer from acceleration) and the rear tire radius. I calculated it roughly, getting rear weight data from a similar year Sportside truck, plugged it into the formula and found that it only would take about 260 lbs-ft of engine torque (3,000 lbs-ft as multiplied by the drivetrain) to slip your tires on pavement, figuring 2400 pounds on the rear tires (2,200 plus 10 percent for acceleration transfer) and the friction coefficient of average pavement (.8). With more weight, you'd get a higher number... and better acceleration." Jim Allen continues, "Your maximum torque multiplication comes from multiplying the engine torque by the first gear ratio, and rear axle ratio. Using the stock Duramax torque, that would be 6,475 lbs-ft in high range and 17,480 lbs-ft in 4WD low range. As long as your traction torque doesn't get to close to the maximum capacity of the axle, you are OK. Given all the variables, you are uncomfortably close with the 10-bolt. You have an extra 1,200 lbs-ft of cushion with the 14-bolt. BTW, the 10.5 axle is rated for 6242 lbs-ft and the new 11.5 inch unit found in the 2500HD/3500 is rated for 8321 lbs-ft."
The complete GM 9-½ rear axle assembly was acquired as a good used core from Spalding Auto Parts in Spokane, Washington. It came equipped with a perfectly good factory G80 limited slip differential (see photo on the left), but our prior experience with the G80 suggested we should consider a more durable alternative. After consulting with both Jim Allen and the techs at Randy's, we decided to install an Eaton Posi, primarily because it would provide both the durability we're after plus deliver excellent street manners. Once the testing phase of the project buildup is complete, this truck will likely live out its life as a daily driver and street cruiser. GM began offering the G80 (aka Gov-Lok, also produced by Eaton) in the 1973 model year pickup trucks. FYI, the name "Gov-Lok" did not originate from Eaton. Their official name is "The Eaton Automatic Locking Differential." Eaton doesn't know where the name "Gov-Lok" came from and although they have tried for years to expunge it, that term appears to be etched in the minds of gearheads. These limited slips offer most truck owners excellent service without differential chatter. However, there are a few drawbacks - most often seen as weakness in both the governor locking assembly and spider/axle-end gears when given rough treatment. We've busted a couple of them since 1999. Originally designed for the GM muscle cars of the sixties and early seventies, the current Eaton Posi offers the beef and long-term durability for high power applications, while providing excellent on-road manners so essential in a street driven pickup truck. The Eaton Posi uses carbon fiber clutch discs, which can outlast standard friction material by a considerable amount. In hard use, standard clutch plates wear rapidly for a period of 40K miles or less, as the unit gradually reverts back to an open differential due to wearing clutch plates and a reduced clutch pack preload. 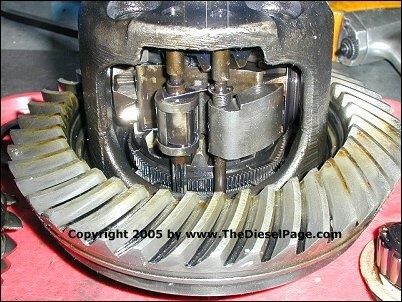 Even in "normal" use, a standard clutch plate type limited slip is pretty much an open diff by 80K miles. The carbon fiber discs may provide normal service up to the 80K mile mark in hard use and perhaps over 100K in normal use. Many of the earlier Eaton Posi differentials can be upgraded to the newer carbon fiber discs. The core axle assembly we used for this buildup came with a set of perfectly useable 3.73 gears. A decision had been made a few weeks earlier to keep the 3.42 differential ratio originally used by our 1989 Silverado project truck. So, Randy's tech Brian Anderson installed a new 3.42 R&P set. 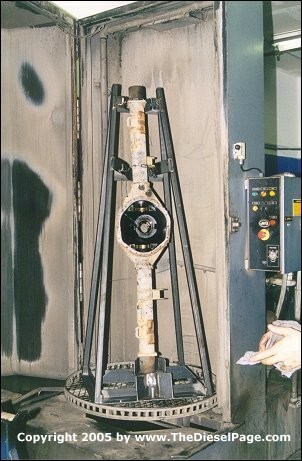 A complete disassembly is the first step in the process of rebuilding any axle. 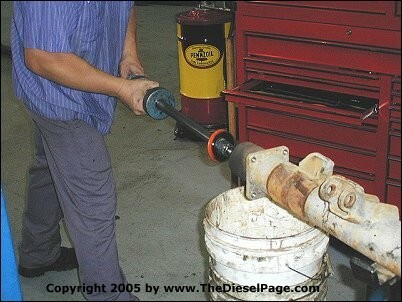 Here a slide hammer is used to extract the original wheel bearings and seals. This GM 14-bolt axle was originally installed in a 1997 model-year Chevy pickup, but a few years of use on the road left it in need of a thorough cleaning, both inside and out. Randy's high-pressure high-temperature caustic parts washer was given the cleaning duties. The turn-table parts holder allows the directional spray nozzles, both above and below, to force hot cleaning solution into all the nooks and crannies over a period of 30-minutes. Once removed from the cleaning machine, the axle housing was pressure dried, then painted. Nice touch! While the axle housing was being cleaned, Brian prepared the new bearings, seals, and pinion crush sleeve for installation. Assembly lube was liberally applied to all of the new bearings. 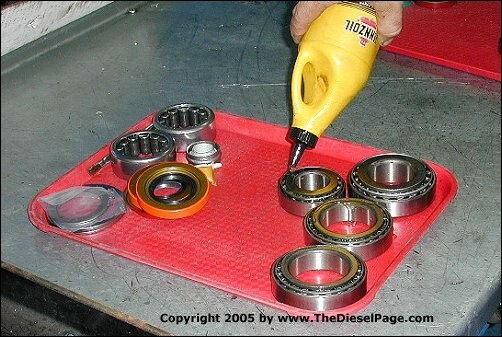 The "Assembly Lube" most often used is 90-wt gear oil. If you use some other lube product, the bearing preloads could read differently than those calibrated for 90-wt. Installation kits, that include all of these parts are available from Randy's, in addition to ring & pinion gear sets and several types of locking differentials. An important pre-assembly step is filing away any burrs or raised areas on the differential flange (many of which are around the holes) that mates with the ring gear. The ring gear must fit absolutely flush on the flange. The ring gear is bolted on using a thread locking compound included in the kit. 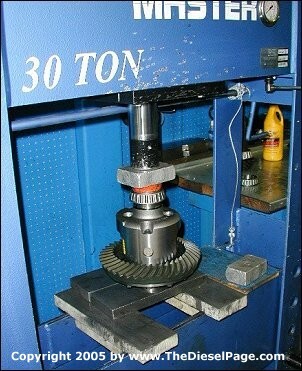 A hydraulic press is generally required to properly fit the new differential carrier bearings. 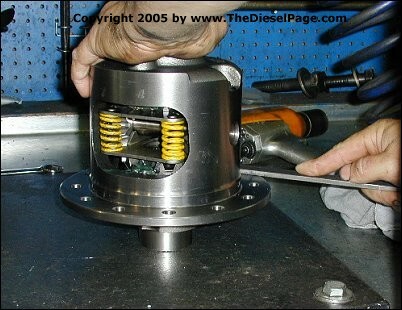 However, carrier bearings can be installed at home without a press if you have some decent drivers and a hotplate. 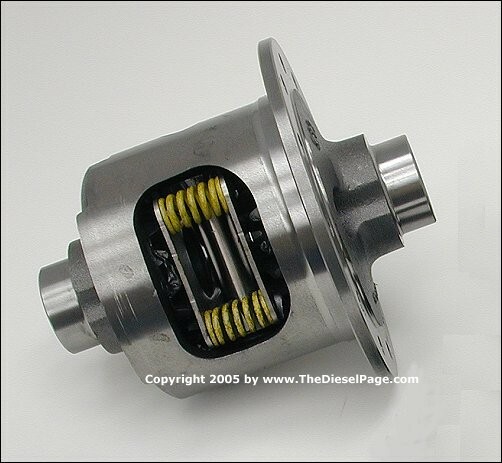 Once new pinion seal, pinion bearings and races are installed in the axle housing, the pinion nut is torqued to preload the bearings. GM service manuals indicate that the pinion bearings preload torque should be in the range of 15-30 lb-in for new bearings and 10-25 lb-in for used bearings. 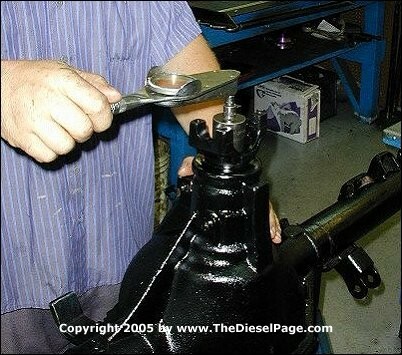 Once the differential has been installed, correct preload torque for pinion and differential bearings combined should be in the range of 30-55 lb-in for new bearings or 25-50 lb-in for used bearings. The new Eaton Posi and carrier bearings are now dropped into place. The adjuster nut on the right side of the carrier is then adjusted, with corresponding shims on the left side, to produce a ring & pinion backlash in the range of .006-.010". This installation produced .008", which is right in the middle of the ideal backlash range. Once the bearing preload and R&P backlash had been set, it was time to see what sort of pattern was developed when the R&P mesh at two or three locations around the ring gear. The mustard yellow compound is included with every shipped differential installation kit. Brian mentioned that sharp edges developed in the pattern would require additional adjustment. Ideally, ring and pinion mesh should produce a dense contact pattern near the center of each tooth, with fading edges, for both a quiet and long service life. Aside from a being a major mail order operation, Randy's also provides differential service to the local community of Everett, Washington. A large well-kept service area is kept busy throughout the week, and is staffed by highly qualified technicians who have all of the best parts, tools and equipment at their fingertips. 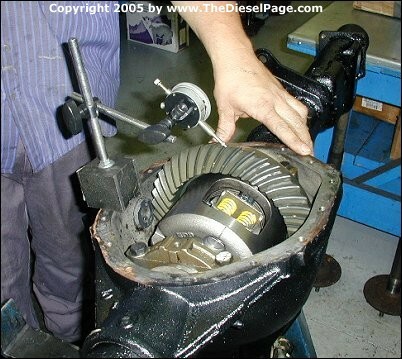 Update 2/21/07: Jim Allen and Randy Lyman (of Randy's Ring & Pinion) have recently collaborated on a new book, appropriately entitled "Differentials", that covers all aspects of axle and differential buildup. This book would be a great addition to the home mechanic's library or for anyone wanting to learn more about their truck's rear axle and differential. 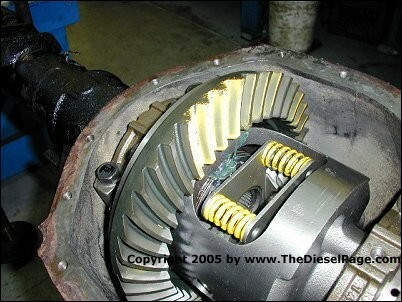 "Differentials" is available from Amazon.com or directly from Randy's Ring & Pinion web site.